K'ang Yu-wei (K’ang Youwie, 康有為; March 19, 1858 – March 31, 1927), was one of the most prominent scholars and political reformers of modern China, and a key figure in the intellectual development of modern China. He is particularly well-known for his radical reinterpretations of Confucianism and for his role as the Emperor's adviser during the abortive Hundred Days Reform movement of 1898. K’ang was born in 1858, to a prominent scholarly family in Guangdong, and received a traditional education in the Confucian classics. Finding these studies oppressive, he began to study Buddhist and Western thought, and developed his own interpretation of Confucianism. He became convinced that the Chinese government must modernize its political and economic institutions in order to withstand the threat of foreign imperialism, and initiated several reform movements. During the Hundred Days Reform movement of 1898 he became a close advisor of Emperor Guangxu; when the Empress Dowager ended the reform with a palace coup he fled into exile to avoid being executed. For fourteen years he traveled among the Chinese communities overseas promoting political reform. His most famous work is Da Tong Shu (大同書), "The Book of Great Unity," a book describing a socialist utopia in which the world is ruled by a central democratic government, the individual family and ownership of private property no longer exist, and marriage is a series of renewable one-year contracts. K'ang Yu-wei was born March 19, 1858, to a scholarly and locally prominent family in Foshan, Guangdong in Canton. Like his father and grandfather, K'ang prepared for the civil service examinations and a bureaucratic career by studying the Confucian classics. He passed the first series of examinations, but in 1876 he failed the provincial examinations and began a three-year course of study under the scholar Chu Tz'uch'I, who taught him an eclectic approach to the various schools of interpretation of the Confucian classics. K'ang learned to search for the ultimate truths in the words of Confucius himself, rather than relying on scholarly commentaries. In late 1878, K'ang experienced an emotional crisis, suddenly feeling that his intellectual talents were being suffocated by pedantic Confucian studies. He sat in solitary meditation, shut in his room, and his friends worried that he had lost his mind. His retreat from the world ended after he received mystical enlightenment. He later wrote,"I perceived suddenly, that I was in an all-pervading unity with Heaven, Earth, and all things. I beheld myself as a sage and laughed for joy. But thinking of the sufferings of mankind I suddenly wept in sorrow." Now believing himself a sage destined "to set in order all under Heaven," K'ang began to study governmental organization and political geography; he also read works of Mahayana Buddhism. Curious about the West, he visited Hong Kong in 1879, and in 1882 toured the foreign concessions in Shanghai. Observing the cleanliness and orderliness in these cities, he realized that the Europeans were different from the "barbarians" of Chinese antiquity, and began to seriously study whatever Chinese literature he could find on the West. Between 1888 and 1890 K'ang became convinced that the orthodox and officially sanctioned version of the Confucian classics had in large part been forged during the ascendancy of the usurper Wang Mang (ruled 8-23 C.E.). Instead of these "Old Text" versions, K'ang favored the "New Text" versions, which had once been the basis of the Confucian orthodoxy during the Former Han Dynasty. These loaned themselves more easily to the service of a political reform movement. K'ang made selective use of the New Text interpretations, to write two of his most important books: The Forged Classics of the Wang Mang Period (1891), demonstrated that the orthodox texts of the classics were not authentic. Confucius as a Reformer (1897), argued that Confucius was the real author of the classics, and that his insistence that he was not the author, but merely the transmitter of the teachings of the ancient sages, had been Confucius's strategy to win acceptance for his own teachings. In this manner, K'ang presented Confucius as a reformer who believed that institutions had to be adapted to altered circumstances. K'ang concluded that Confucius, had he been alive in the 1890s, would also have advocated the reform of the existing political and economic order. In 1891, K'ang Yu-wei opened a school in Canton, where he taught many students, like Liang Ch'i-ch'ao (Liang Qichao, 梁啟超, Liáng Qǐchāo; pseudonym: Rengong,任公), who later became his dedicated followers. The course of study included K'ang's interpretations of Confucianism and also the study of the West, mathematics, music, and even military drill. In 1893 K'ang passed the provincial civil service examinations, and in 1895 he succeeded in the highest level of examinations in Peking. He was appointed a secretary second-class in the Board of Works and might have pursued a normal bureaucratic career had he not in the same year, at the age of thirty-seven, become involved in national politics. In April 1895, the Sino-Japanese War was ended by the signing of the Treaty of Shimonoseki. The terms of this treaty were humiliating and damaging to China, and K'ang Yu-wei, together with Liang Ch'i-ch'ao, obtained the signatures of nearly 1,300 scholars on a petition urging the court to disavow the treaty. The petition had no effect, and K'ang, quickly sent two memorials to the Emperor proposing extensive governmental, educational, and economic reforms. When these memorials were similarly ignored by the court, K'ang turned his energies to organizational and propaganda work, attempting to increase the interest of Chinese intellectuals in reform. 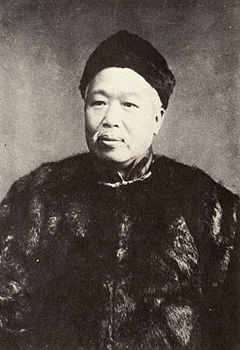 The most notable of several reform societies with which K'ang associated himself between 1895 and 1898 was the Ch'iang-hsüeh hui (Society for the Study of National Strengthening). Organized in August 1895, it won the support of numerous eminent officials, such as Chang Chih-tung (Zhang Zhidong, 张之洞) and Yuan Shikai (袁世凱). The success of this reform society frightened powerful conservative officials, and the Ch'iang-hsüeh hui was banned in early 1896. During 1897 and early 1898 the foreign powers were claiming "spheres of influence" in China, and it seemed inevitable the country would soon be partitioned by the imperialists. K'ang Yu-wei, alarmed by the renewed threat to China, formed several new societies, most prominent of which was the Pao-kuo hui (Society for the Preservation of the Nation). This organization was founded in April 1898 with the avowed goal of saving "the nation, the race, and the Confucian teaching." He also submitted a succession of reform memorials to Emperor Kuang-hsü (Guangxu, 光緒帝). In January 1898, the Emperor, who had now also become convinced of the need for reform, commanded K'ang to elaborate on his proposals. K'ang also wrote two short books for the Emperor, one on Peter the Great of Russia and one on the Japanese Meiji restoration, and these reportedly strengthened the Emperor's determination to modernize the nation. On June 12, 1898, Emperor Kuang-hsü issued a momentous edict proclaiming a new national policy of "reform and self-strengthening." Four days later K'ang was called to an imperial audience, and for the next three months the Emperor, under K'ang's influence, issued a series of decrees designed to reorganize the outdated dynastic system. The reform movement, known as the Hundred Days' Reform, was cut short by the Empress Dowager Cixi ( Tz'u-hsi, 慈禧太后, popularly known in China as the West Empress Dowager) and her conservative supporters in a palace coup on Sept. 21, 1898. The Dowager Empress ordered K'ang executed by the method of ling chi, or "death by a thousand cuts," but K'ang, forewarned by the emperor, had left Peking for Shanghai the previous day. Together with Liang Qichao he escaped to Hong Kong in a British gunboat, and went to Japan. For the next fourteen years K'ang lived in exile and continued his political activities. Fearing that Kuang-hsü's life was in danger, and convinced that the restoration of power to the Emperor represented the only hope for China, K'ang and Liang founded the Pao-huang hui (Society to Protect the Emperor) in July 1899. This organization had branches among Chinese living in Japan, Southeast Asia, Latin America, Canada, and the United States. K'ang and Liang traveled throughout the Chinese diaspora, promoting constitutional monarchy and competing with Sun Yat-sen's Revive China Society and Revolutionary Alliance for funds and converts. During this time, K'ang wrote several scholarly commentaries on the classics and also some denunciations of the anti-Manchu revolutionaries. He traveled in India, Europe, and the United States, and, as he became more familiar with the West, he gained an increased appreciation for the traditional culture of China. After China became a republic in 1912, K'ang Yu-wei never became wholly reconciled to the revolutionary overthrow of the Confucian monarchy. He remained an advocate of constitutional monarchy and ardently supported the brief restoration of the Ch'ing dynasty in 1917 by Chang Hsün (General Zhang Xun, 張勳, Zhāng Xūn) whose soldiers, wearing queues, occupied Beijing and declared the restoration of Puyi on July 1. K’ang, becoming suspicious that Zhang did not care about constitutionalism and was merely using the restoration to become the power behind the throne, abandoned the mission and fled to the US legation. On July 12, Duan Qirui (段祺瑞), a Chinese warlord and commander in the Beiyang Army, easily took the city. As late as 1923, K’ang was still seeking support among warlords such as Wu P'ei-fu ( 吳佩孚)) for his plan to revive the Ch'ing dynasty and impose Confucianism as the officially sanctioned religion. By the time K'ang died on March 31, 1927, most Chinese intellectuals dismissed him as a hopeless relic of the past. K'ang was poisoned in the city of Qingdao, Shandong in 1927. He was sixty-nine. K'ang's daughter, K’ang Tongbi (康同壁) was a student at Barnard College. During the late nineteenth century, China’s helplessness under the threat of imperialist advances was becoming increasingly obvious. Chinese intellectuals, who during the mid-1800s had been confident that China’s traditional ways were superior to the West, now realized that China must reform its political institutions and economic system if it were to avoid becoming a European colony. K’ang Yu-wei was at the forefront of the movement which tried to re-shape China’s imperial government so that it could withstand the pressures of the modern world. K'ang turned to Confucianism as a source of ideals and inspiration for the new form that Chinese government should take. He portrayed Confucius as a political and social reformer and not a reactionary, and even argued that the rediscovered versions of the Confucian classics were a forgery in order to bolster his claims. K'ang was a strong believer in constitutional monarchy and wanted to remodel the country after Meiji Japan. These ideas angered his scholarly colleagues, who had received a traditional Confucian education and regarded him as a heretic. Due to his desire to end the traditional Chinese family structure, he is regarded as an advocate for women's rights in China. He was also active in ending the practice of foot-binding of young girls in China. The most well-known, and probably controversial, work of K'ang Yu-wei was the Da Tong Shu (大同書). The literal meaning of the title is "The Book of Great Unity," but its meaning derives from the name of a utopian society imagined by Confucius. The book was based on notes from lectures he had given since 1884, but it wasn't until his exile in India that he finished the first draft. The first two chapters were published in Japan in the 1910s, and it was published in its entirety seven years posthumously, in 1935. It is a proposal for a utopian world, free of political boundaries and ruled by one central government. K’ang’s scheme was that the world would be divided into rectangular administrative districts, each of which would be self-governing as a direct democracy, though still loyal to the central government. K’ang wished to abolish the institution of the family, which he saw as a cause of strife since the beginning of mankind, and replace it with state-run institutions such as nurseries and schools. He also wanted to end the private ownership of property. K’ang considered the current form of marriage, in which a woman was trapped for a lifetime, as oppressive, and suggested replacing it with renewable one-year contracts between a woman and a man. K’ang believed in equality between men and women, and did not think that any social barrier should bar women from doing whatever men can do. K’ang regarded capitalism as an inherently evil system, and believed that government should establish socialist institutions to supervise the welfare of each individual, including government-run retirement homes for the elderly. In one part of the book he even advocated that government adopt the methods of "communism," and although the sense in which he meant this term is debated, he was probably one of the first advocates of Western communism in China. Whether K’ang's socialist ideas were inspired more by Western thought or by traditional Confucian ideals is still under debate. Lawrence G. Thompsom points out that his work is permeated with the Confucian ideal of ren, or humanity, and believes that his socialism was based on more traditional Eastern ideals. Thompsom also points out a reference by K’ang to Fourier, and certain Chinese scholars believed that K’ang's socialist ideals were influenced by Western intellectuals after his exile in 1898. Most Confucian scholars of his time believed that Western technology should only be adopted to defend China against the West, but K’ang Yu-wei believed that Western technological progress had a central role in saving humanity. He wholeheartedly embraced the modern idea that technology is integral to the advancement of mankind. In Da Tong Shu he showed enthusiasm for bettering humanity by the use of technology. He foresaw a global telegraphic and telephone network which connected everyone to everyone else. He also believed that technology could reduce human labor, to the point where each individual would only need to work three to four hours each day, a prediction that would be repeated by the most optimistic futurists later in the century. When the book was first published it was received with mixed reactions. Because of K’ang's support for the Gaungxu Emperor, he was seen as a reactionary by many Chinese intellectuals. They believed that K’ang's book was an elaborate joke, and was merely written to show the utopian paradise that could have developed if the Qing dynasty had not been overthrown. Others view K’ang as a bold and daring proto-Communist who advocated modern Western socialism and communism. Amongst those in the second school was Mao Zedong, who admired K’ang Yu-wei and the socialist ideals in Da Tong Shu. Modern Chinese scholars more often take the view that K’ang was an important advocate for Chinese socialism, and despite the controversy, Da Tong Shu still remains popular. A Beijing publisher even included it in a list of the "100 Most Influential Books in Chinese History." ↑ Jinghao Zhou, Keys to Women’s Liberation in Communist China: An Historical Overview, Journal of International Women’s Studies, Vol. 5 #1 Nov. 2003. Retrieved May 23, 2007. Cameron, Meribeth E. The Reform Movement in China, 1898-1912. New York: Octagon Books, 1963. Howard, Richard C. “K’ang Yu-wei (1858-1927): His Intellectual Background and Early Thought,” in A.F. Wright and Denis Twitchett (eds. ), Confucian Personalities. Stanford: Stanford University Press, 1962, pp. 294-316 and 382-386 (notes). Hsaio, Kung-Chuan. A Modern China and a New World – K`ang Yu-wei, Reformer and Utopian, 1858-1927. Seattle and London: University of Washington Press, 1975. Karl, Rebecca and Peter Zarrow. Rethinking the 1898 Reform Period – Political and Cultural Change in Late Qing China. Cambridge/Mass. : Harvard University Press, 2002. Lo, Jung-pang. K'ang Yu-Wei; A Biography and a Symposium. Monographs and papers (Association for Asian Studies), no. 23. Tucson: Published for the Association for Asian Studies by University of Arizona Press, 1967. Teng, Ssu-Yu and John K. Fairbank. China’s response to the West – a documentary survey 1839-1923. Cambridge/Mass. : Harvard University Press, 1954, 1979. Thompson, Laurence G. Ta t´ung shu: the one-world philosophy of K`ang Yu-wei. London: George Allen and Unwin, 1958. This page was last modified on 11 April 2018, at 14:19.